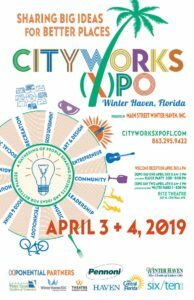 CityWorks(X)po Florida Returns to Winter Haven for Fourth Year | Winter Haven Economic Development Council, Inc. The fourth annual CityWorks(X)po Florida is coming to Winter Haven April 3-4, 2019, and this year’s lineup of speakers is sure to inspire attendees with thought-provoking presentations and engaging dialogue. The evening schedule includes special networking opportunities and entertaining events. With generous enthusiasm and support from CityWorks(X)po founder, Main Street Winter Haven, Inc., is again partnering with the Greater Winter Haven Chamber of Commerce, City of Winter Haven, Winter Haven Economic Development Council and Visit Central Florida to bring you this placemaking summit, idea exchange and festival-style conference. CityWorks(X)po Florida provides a platform for sharing knowledge, stories and projects, enabling attendees to make connections and gather ideas that inspire them. This year’s (X)po will connect speakers, panelists and participants who have a common goal of making the place they live better for everyone. 5:30-8:30 pm After Hours Social – Parking Lot Party – Bike Shop of Winter Haven, 249 3rd Street SW ~ This event is designed to capture the energy of attendees, giving them an opportunity to connect and discuss the day in a fun environment while enjoying live music, heavy appetizers and craft beer provided by Grove Roots Brewing Co.
5:00 pm Immediately following the wrap up, we invite you to join us on the mezzanine level for our After Hours Social, for great food, drink and conversation inspired by the day. Registration and more information about the (X)citing lineup of speakers is available at www.cityworksxpofl.com. If you would like to become a sponsor and help bring this innovative conference to our area, contact Main Street Winter Haven at 863-295-9422. The Winter Haven Economic Development Council is pleased to once again be one of Main Street Winter Haven’s partners for this year’s (X)po. CityWorks(X)po Florida speakers are described in this way: Engaging. Innovative. Endlessly Interesting. We look forward to hearing from them and hope you’ll join us to learn about inspiring projects that can help build stronger communities.